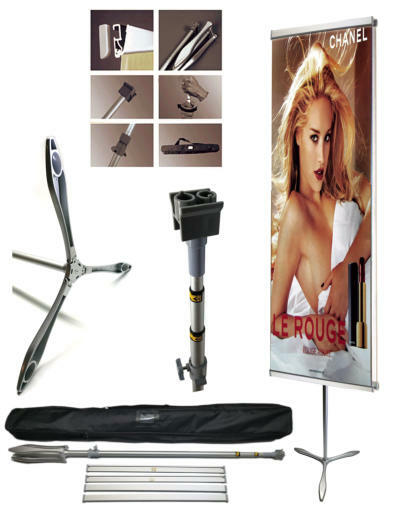 Poster Stand D, POST-D1 Double-sided straight poster hanger with a zinc-metal, folding tri-base. Height is fully adjustable with a total poster size of 24” wide by 18” to 88“ tall. Posters can be displayed up to 28” off the ground. Crossbars securely clamp the poster at top and bottom. The center support pole is telescopic and spring-loaded to keep the banner taut. The top bar holder has two D-Lamp supports. The tri- base has rubber-pad feet. Deluxe padded carrying case included. Case qty: 10.